This study clarifies the character of 'political economy' as a distinct and separable intellectual discipline in the generic sense, in the texts of Adam Smith. It focuses upon the scope and fundamental conceptualizations of the new science. Smith's conceptualization of economic analysis is shown to constitute a unified intellectual piece for understanding economic society and its dynamics. 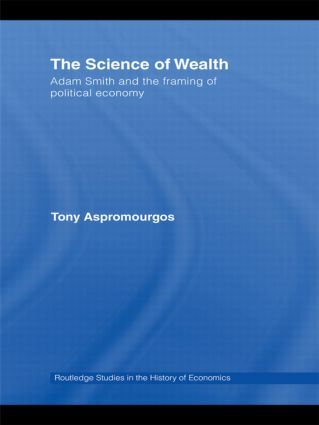 Smith's fundamental economic language is exhaustively examined, in all his texts, with a view to clarifying the meaning of the basic concepts of his system. As well, the 'prehistories' of those concepts, in literature prior to Smith, back to the earliest times, are quite comprehensively treated, thereby placing his political economy in its larger historical context and conveying a rich sense of the history of these ideas over the whole course of our civilization. A quite complete account of Smith's economics as a whole is also entailed by this undertaking: his key substantive economic doctrines are thoroughly considered as well, and all the elements of his economic theory receive attention. To that extent, notwithstanding the focus on concepts, an interpretation of the substance of Smith's political economy is also provided. This focus is partly motivated by the view that Smith's intellectual triumph in the history of social science is not so much about the success of specific doctrines. His more considerable theoretical success is at a deeper level: gaining a wide and long-lasting acquiescence in the conceptual universe framed by the fundamental structures of his system, for a newly emerging discipline. Those who subsequently contested Smithian doctrine did so within Smith's framework; they did so 'on his terms'. While the book's primary purpose is to reconstruct the character of Smith's political economy as a distinct intellectual enterprise, it also addresses its relevance to modern economics, and to policy and practice in contemporary liberal society.